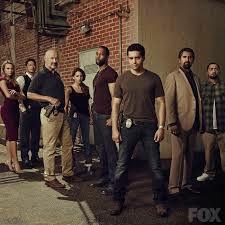 The new Fox drama Gang Related premiered last Thursday at 9pm with a strong set up, some useful performances and a huge amount of potential. Ramon Rodriguez is the lead of the show as Ryan Lopez, an LAPD detective who is an integral part of the multi-agency Gang Task Force; a group whose remit is to take down the major gangs in the local area. Unbeknownst to the law enforcement authorities, Javier Acosta, the powerful head of the Acosta Crime Family, has placed Lopez inside the police department. If that sounds somewhat similar to the 2006 Martin Scorsese thriller The Departed, which starred Leonardo DiCaprio, Matt Damon and Jack Nicholson, that’s certainly not a bad association to have even if Gang Related appears on the surface to have only one half of that movie plot. Rodriguez, who previously came to attention in The Wire and Day Break, is very likeable here in what already shapes up as a star making turn. It will take some decent acting chops to convey the duality of his situation and the actor did not disappoint in the opening episode coming across as a character with one foot very firmly placed in each camp. Also heavily on the plus side is New Zealand actor Cliff Curtis, who takes on the role of Javier Acosta. A native Maori, who has curiously fallen into the screen role of playing various ethnicities, Curtis exudes charm as the family patriarch while hinting at the menace that lies just below the surface. Jay Hernandez and Rey Gallegos are Acosta sons Dante and Carlos who demonstrate the extremes of the family as the business school educated Dante wants to turn away from crime while Carlos is a violent loose cannon who very quickly endangers his father’s prime asset within the department. On the law enforcement side Terry O’Quinn, he of John Locke in Lost fame, is Sam Chapel the head of the Task Force and rapper, producer and actor RZA is the DEA Agent Cassius Green who becomes the partner of Lopez. Some 20 minutes into the show I was sold on Gang Related when it had the confidence to have RZA, in character, sing badly over Al Green’s classic 1972 hit Lets Stay Together and for Lopez to call him out over it. That speaks to the creator and writer of the show, Chris Morgan, having a very strong sense as to who his characters are and where he wants them to go while also throwing a sly wink at the audience. A 13-episode first season gives little leeway from a ratings’ standpoint and Gang Related must pick up an audience quickly if it is to survive. With Sung Kang, Inbar Lavi and Shantel VanSanten playing agents from the FBI and ICE and an Assistant District Attorney, respectively, there is also enough potential character development to build upon should the series require it. However ultimately the show is going to live or die on how the audience responds to Rodriguez in the main role. The tag line for the series is ‘Every villain has a noble cause and every hero has a dark side,’ and that appears to be exactly how the show intends to play out. I’ll admit I’m intrigued. Fans of Twitter can find some of the cast and crew and their Twitter accounts in a Gang Related list here.